F Class Submarine: Laid down, as Barracuda, 23 August 1909, at Union Iron Works, San Francisco, CA; Renamed F-2, 17 November 1911; Launched, 19 March 1912; Commissioned USS F-2, 25 June 1912; Placed in ordinary, 16 March 1916, at Mare Island Navy Yard, Vallejo, CA. ; Placed in full commission, 13 June 1917; Decommissioned, 16 March 1922, at Mare Island Navy Yard, Vallejo, CA. ; Struck from the Naval Register, (date unknown); Final Disposition, sold 17 August 1922, fate unknown. Specifications: Displacement, surfaced 330 t., submerged 400 t.; Length 142' 7"; Beam 15' 5"; Draft 12' 2"; Speed, surfaced 13.5 kts, submerged 11.5 kts; Depth Limit 200'; Complement 1 Officer 21 Enlisted; Armament, four 18" torpedo tubes, four torpedoes; Propulsion, diesel electric, New London Ship & Engine Co., engines, 780 hp, Fuel Capacity 11,500 gal., Electro Dynamic Co. motors, 620 hp, Battery Cells 120, twin propellers. 210k U.S. submarines (SS-20) through (SS-23). General plans prepared by the Fore River Shipbuilding Company, Quincy, Massachusetts, 18 June 1910. This sheet features inboard and outboard profile drawings. These submarines were constructed by the Union Iron Works, San Francisco, California. 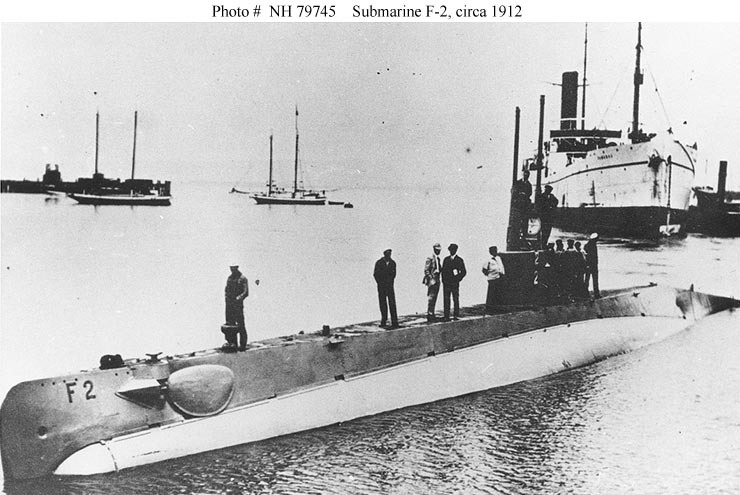 Initially named Carp (SS-20), Barracuda (SS-21), Pickerel (SS-22) and Skate (SS-23), they were renamed F-1 (SS-20) through F-4 (SS-23) in November 1911, while under construction. The original plan is in Record Group 19 at the U.S. National Archives. U.S. Naval Historical Center Photograph # NH 84383. Courtesy of Donald M. McPherson, 1976. 201k U.S. Submarines (SS-20) through (SS-23). General plans prepared by the Fore River Shipbuilding Company, Quincy, Massachusetts, 18 June 1910. This sheet features a table of dimensions, deck plans and hull section drawings. 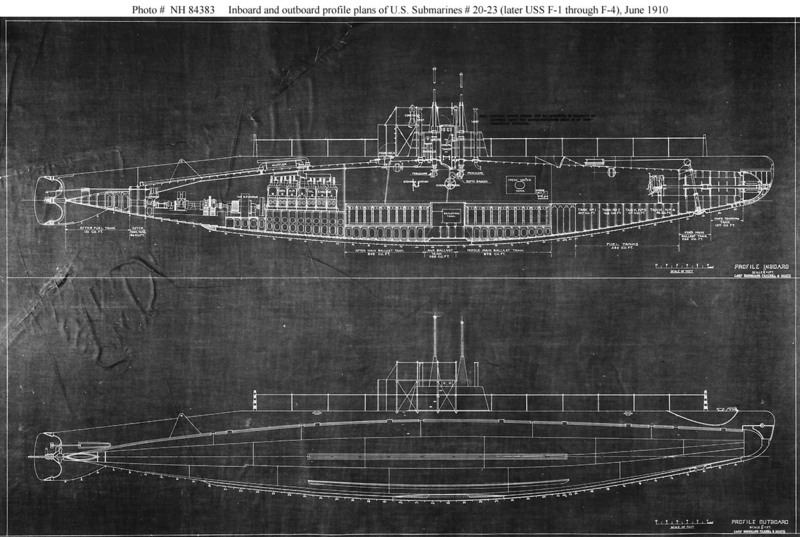 These submarines were constructed by the Union Iron Works, San Francisco, California. 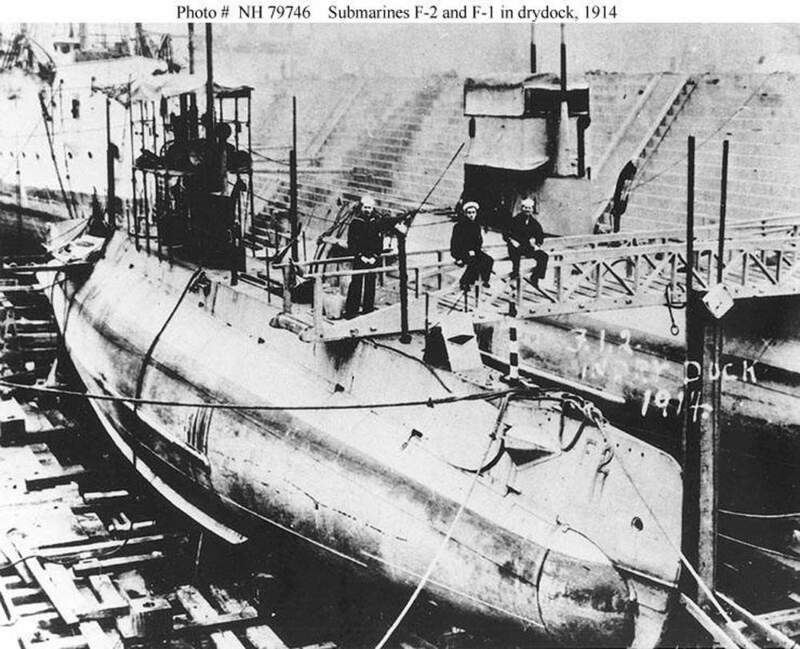 Initially named Carp (SS-20), Barracuda (SS-21), Pickerel (SS-22) and Skate (SS-23), they were renamed F-1 (SS-20) through F-4 (SS-23) in November 1911, while under construction. 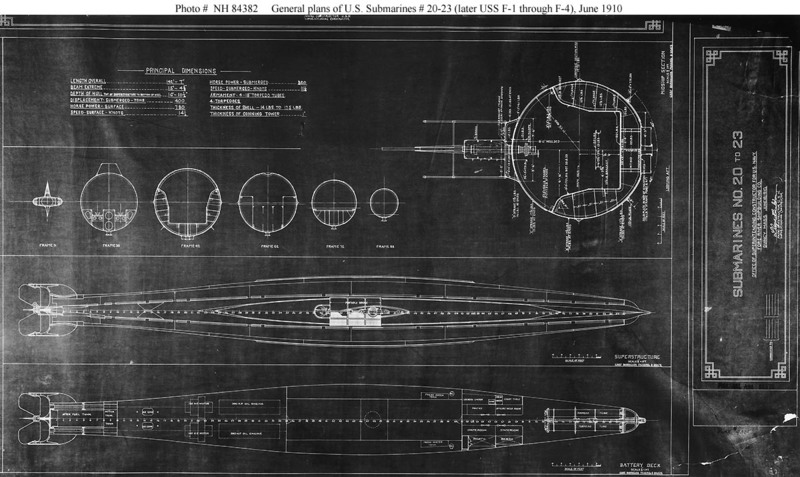 The original plan is in Record Group 19 at the U.S. National Archives. U.S. Naval Historical Center Photograph # NH 84382. Courtesy of Donald M. McPherson, 1976. 24k In the F class (SS-20 - 23) the conning tower is shown in dashed vertical lines between the two periscopes. This class & the E class (SS-24 - 25) introduced bow planes into Electric Boat practice. Drawing by Jim Christley. Photo & text courtesy of U.S. Submarines Through 1945, An Illustrated Design History by Norman Friedman. Naval Institute Press. 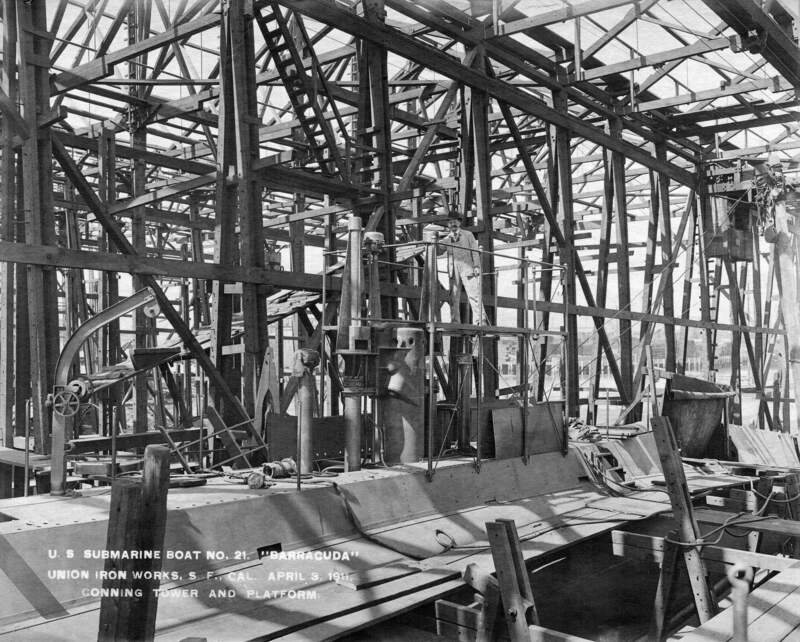 1.62k The submarine F-2 (SS-21) under construction at Union Iron Works, San Francisco, CA., 3 April 1911. Photo courtesy from the files of the Vallejo Naval & Historical Museum courtesy of Darryl L. Baker. 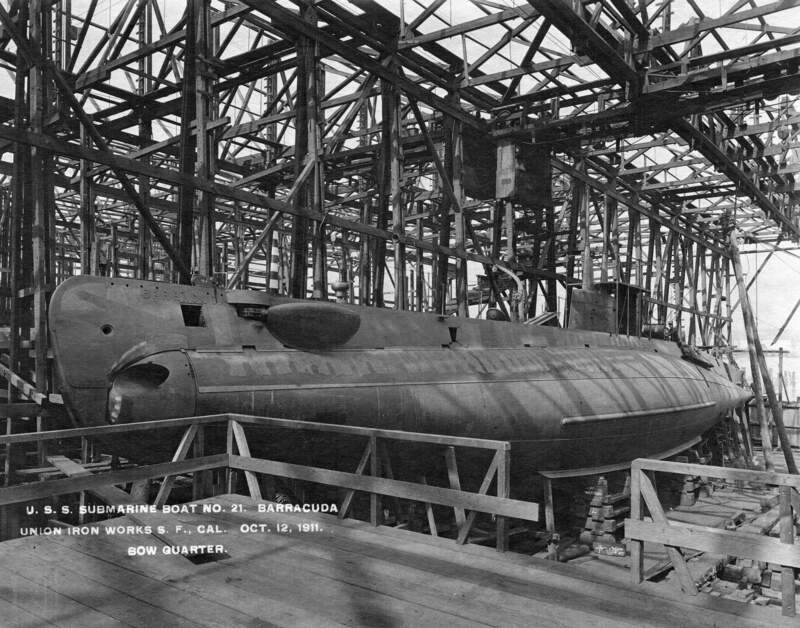 1.52k The submarine F-2 (SS-21) under construction at Union Iron Works, San Francisco, CA., 12 October 1911. Photo courtesy from the files of the Vallejo Naval & Historical Museum courtesy of Darryl L. Baker. 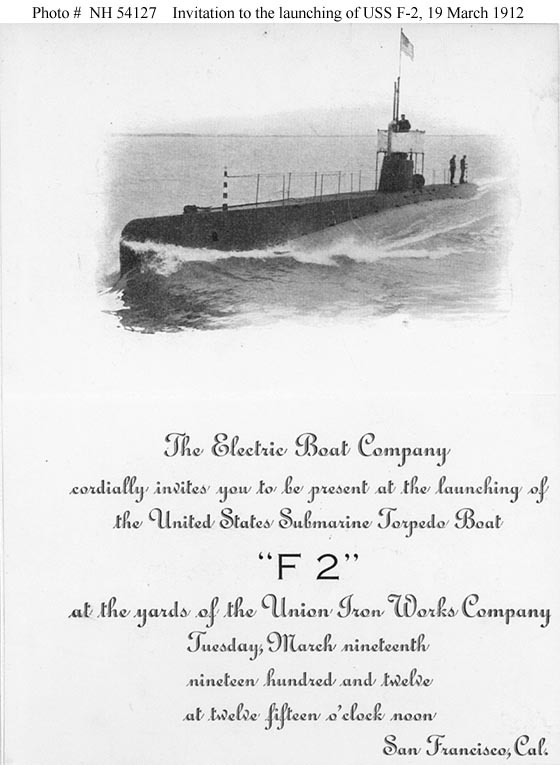 60k F-2 (SS-21) invitation to her launching, held at the yard of her builder, the Union Iron Works, San Francisco, California, on 19 March 1912. U.S. Naval Historical Center Photograph # NH 54127.Collection of Rear Admiral Ammen Farenhold, USN (Medical Corps), 1932. 154k F-2 (SS-21) ready for launching at the Union Iron Works shipyard, San Francisco, California, 19 March 1912. 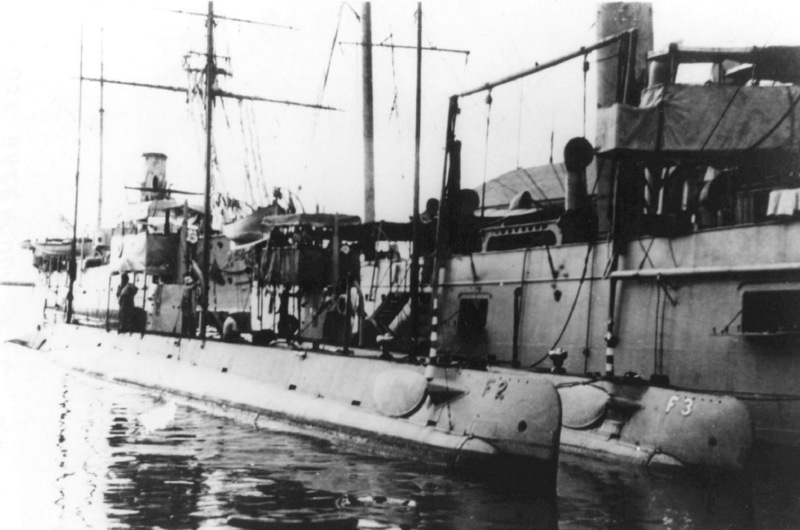 Note the number "22" mounted on the submarine's conning tower, her retractable bow planes, and the starry striped bunting on her lifelines. U.S. Naval Historical Center Photograph # NH 69797. 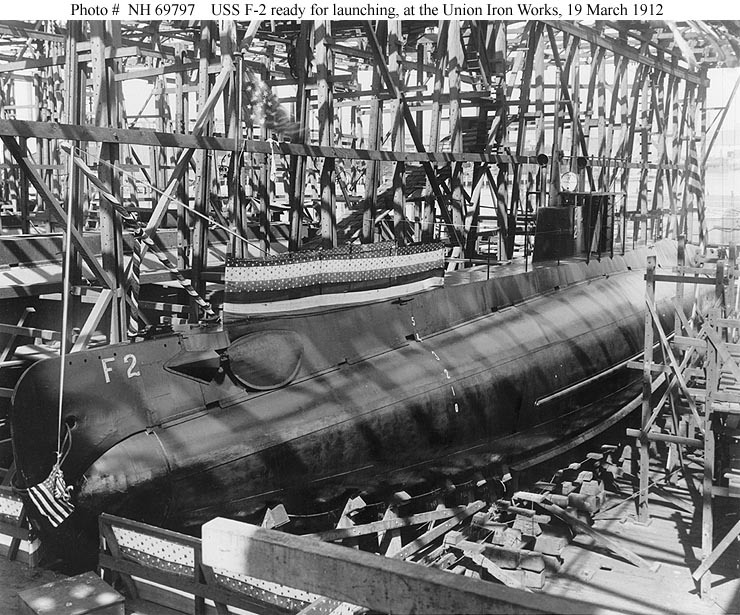 1.3m Photo of the newly launched F-2 (SS-21) of Union Iron Works, San Francisco on 19 March 1912. USN photo courtesy of Darryl L. Baker. 1.14 Splash! And Now' Tis Annette Rolph, U.S.N. Annette Reid Rolph christening the submarine Barracuda (SS-21). Image and text provided by University of California, Riverside; Riverside, CA. Photo from The San Francisco Call. (San Francisco [Calif.]) 1895-1913, 20 March 1912, Image 5 via chroniclingamerica.loc.gov. 1.47k From front to back: F-4 (SS-23), F-2 (SS-21), F-3 (SS-22) and F-1 (SS-20), in port Honolulu 1914. The US Army Transport Dix is in the background. Note the "fish" flags and 13-star "boat" ensigns flown by these submarines. Photographed by Noggle. USN photo # NH 63259, from the collections of the US Naval Historical Center. 1.03k Nine photo PDF of F-2 (SS-21) crew life. Photos courtesy of Tommy Trampp. 106k F class (SS-20 - 23) submarines at the Mare Island Navy Yard, California, before World War I. This view shows the bows of F-1 (SS-20), F-2 (SS-21), & F-3 (SS-22). U.S. Naval Historical Center Photograph # NH 92187. Collection of Thomas P. Naughton, 1973. This is the way the K submarines looked as they glided to their dock in the navy slip Thursday afternoon, completing their run of 2,180 miles from San Francisco to this port under their own power-a big feat performed in a big way, and adding fresh laurels to the American navy. In the upper picture is shown the K-8 (SS-39) slowing down as she entered the slip, the last of the four submersible to complete the voyage. The lower view shows the K-3 (SS-34) in the foreground, another K boat and the F-1 (SS-20), F-2 (SS-21), & F-3 (SS-22) in the background. Image and text provided by University of Hawaii at Manoa; Honolulu, HI. Photo from the Honolulu Star-Bulletin. (Honolulu [Oahu, Hawaii) 1912-current, 16 October 1915, 3:30 Edition, Image 17, courtesy of chroniclingamerica.loc.gov. 84k F-4 (SS-23) at left at anchor in Honolulu, HI. with F-1 (SS-20), centre, and F-2 (SS-21) outboard, moored together. Date unknown. Courtesy of MMCM (SS) Greg Peterman USN Retired. Text i.d. from "The Romance of A Submarine" by G. Gibbard Jackson & submitted by Robert Hurst. 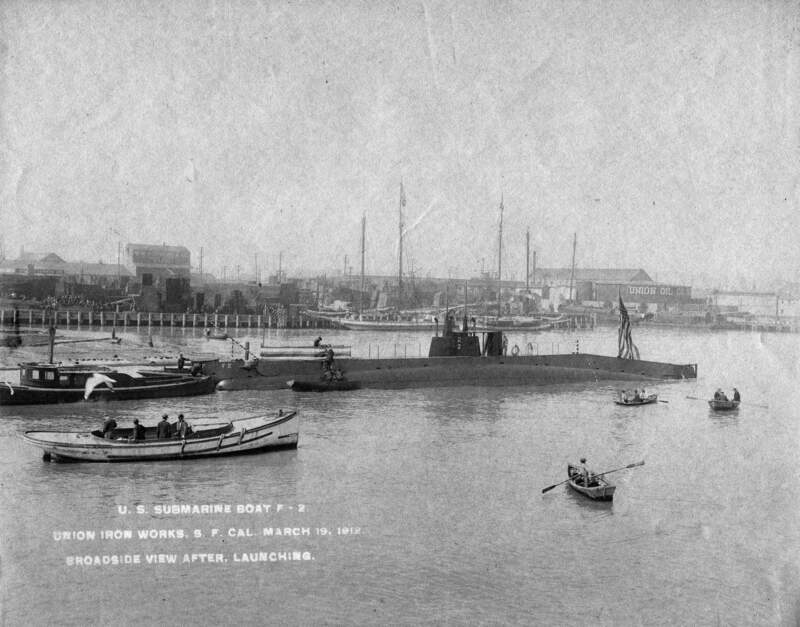 77k F-2 (SS-21) in a harbor, circa 1912. U.S. Naval Historical Center Photograph # NH 79745. Courtesy of Donald M. McPherson, 1974. 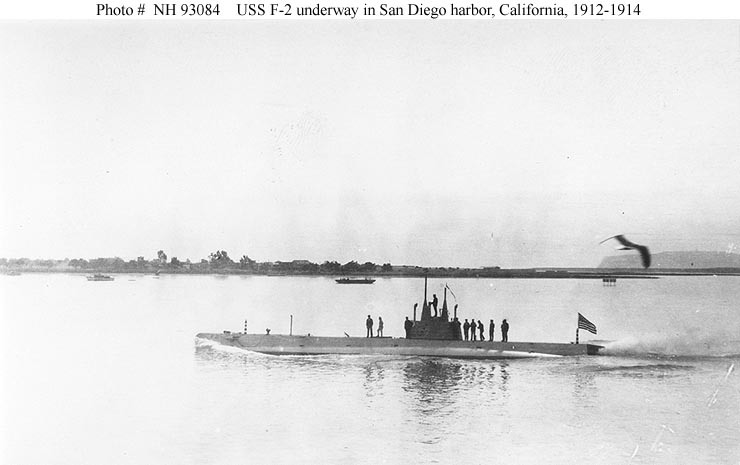 40k F-2 (SS-21) underway in San Diego harbor, California, circa 1912-1914. U.S. Naval Historical Center Photograph # NH 93084.Collection of Hubert C. Rickert, courtesy of Daniel Rickert, 1981. 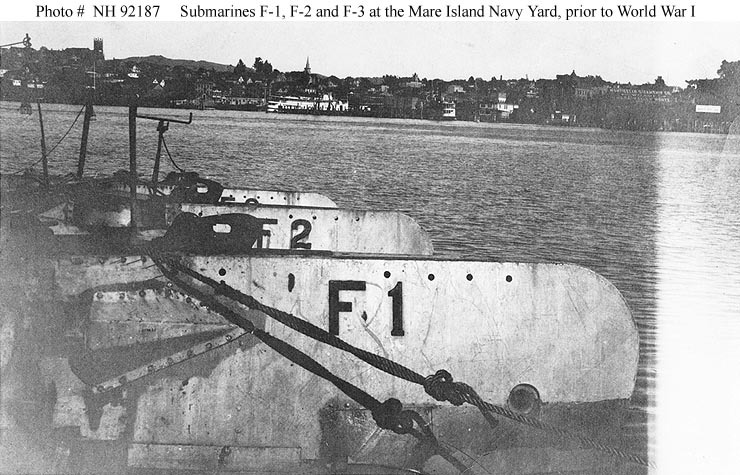 994k F class (SS-20 - 23) submarines and their tender are in DD#2 at Mare Island on 21 January 1913. 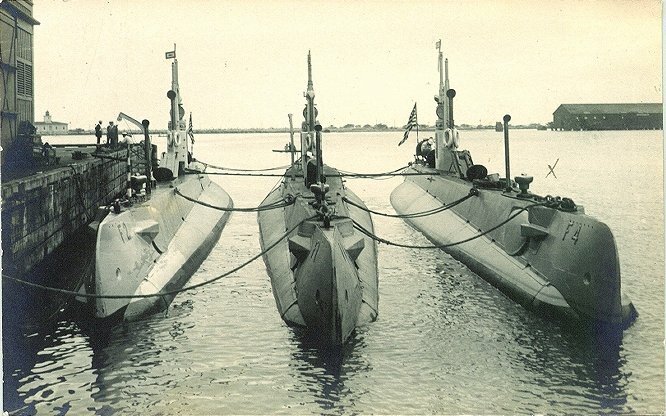 Left to right: F-3 (SS-22), F-2 (SS-21), F-1 (SS-20) and Alert (AS-4) in the background. USN photo / MINSY # 01211913-01 courtesy of Darryl L. Baker. 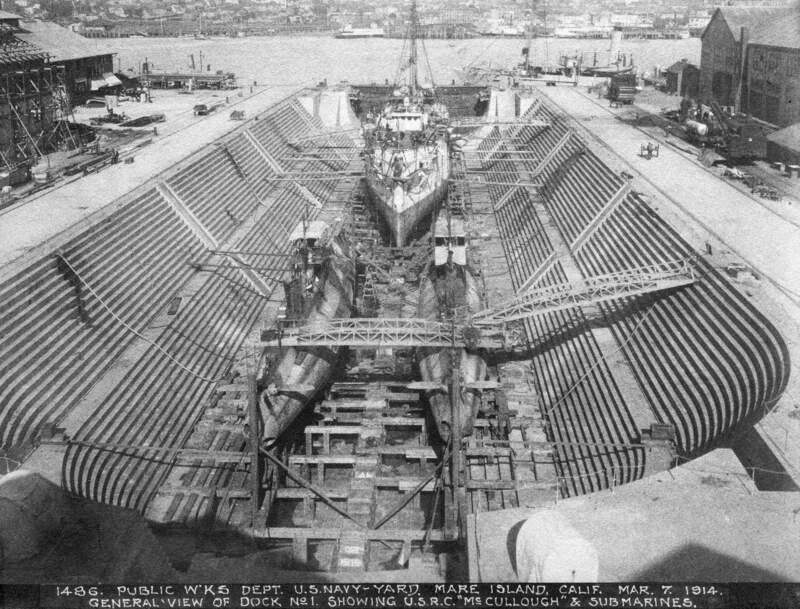 985k The submarine F-2 (SS-21) (left) and F-1 (SS-20), (right) and the USRC McCulloch are seen in Mare Island Navy Yard Dry Dock #1 on 7 March 1914. USN photo / MINSY # 1486-3-1914 courtesy of Darryl L. Baker. 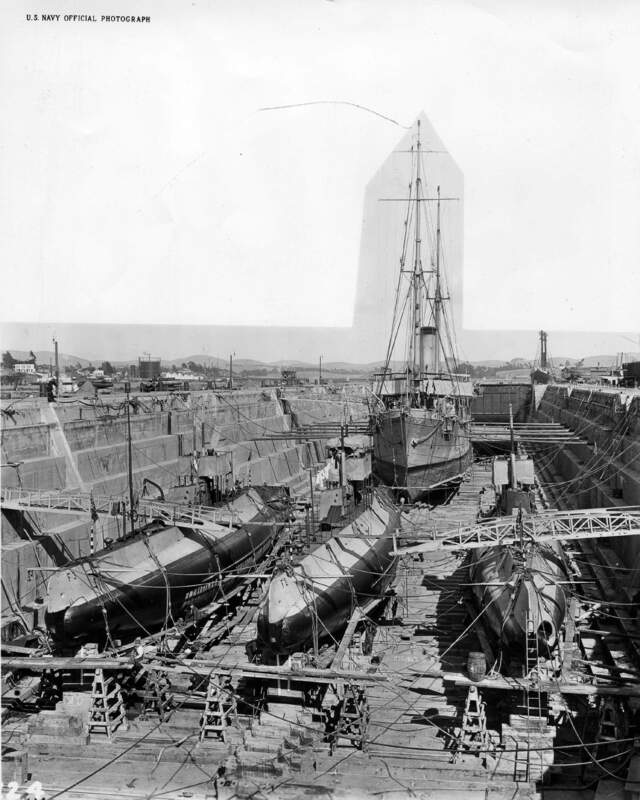 132k F-2 (SS-21) in drydock in 1914, with her sister F-1 (SS-20) alongside. U.S. Naval Historical Center Photograph # NH 79746, courtesy of Donald M. McPherson, 1976 via Robet Hurst. F-2 (SS-21), L-6 (SS-45), & what appears to be H-6 (SS-149)?, H-4 (SS-147), R-7 (SS-84). Photo is at or after 30 June 1921 through 1 July 1922. The R-7 had arrived from the Panama Canal then and the L-6 was placed in commission, in ordinary, 24 March 1922; returned to full commission 1 July; and sailed for the east coast the same month. All the H-class boats left on 25 July 1922 for the east coast as well. Notice that the other boats seem higher out of the water, which is indicative of the H-class boats which had a higher beam than the F & L-classes. The boats behind this group are too far away to i.d. properly. USN photo courtesy of Robert M. Cieri. Partial text courtesy of DANFS. Photo i.d. courtesy of Ric Hedman.